In the borough that’s outpacing Manhattan in new construction projects, Crown Heights and its southern neighbor, Prospect-Lefferts Gardens, are seeing a particularly visible building boom. New construction projects are underway or set to begin soon at 13 different properties in the neighborhood, almost all of it residential. 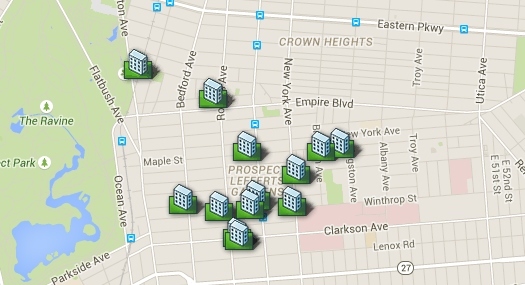 That’s in addition to the 15 development sites rounded up by DNAinfo New York in the area last fall. Many are small projects set to replace detached, single-family homes. Others are much larger and on bigger lots, like the 173-unit project planned by developer Cornell Realty at the site of a former Brooklyn Botanic Garden building on Montgomery Street near Washington Avenue. All of the projects are located inside the borders of Community Board 9 where a debate over rezoning parts of the neighborhood has metconsiderable resistance from community activists, effectively coming to a standstill since the process began last year. This one-story commercial property formerly owned by the Brooklyn Botanic Garden is set to become a 12-story, 173-unit residential building built by developer Cornell Realty, according to reports and permits filed in March. Architect Karl Fischer,described by Curbed as “everyone’s favorite mediocre architect,” will design the building. A new owner of this brick house plans to turn it into a five-story residential building, according to plans filed in mid-April with the city. The company “MJ 195 Sullivan LLC” bought the property in the fall of 2014 for $700,000 and a demolition was approved in December. The news of the project was first reported by New York YIMBY. 1930 and 1934 Bedford Ave. These two single-family homes on Bedford Avenue between Fenimore and Hawthorne streets are set to be demolished and turned into a seven-story, 38-unit apartment building developed by Nik Lavrinoff, according to permits and reports. One of the lots, 1934 Bedford, sold for $1.4 million in November, property records show. It’s unclear for how much the other lot sold. Hawthorne Brothers LLC bought this wood-frame house for $1.4 million in March, property records show. Around the same time, the company filed a permit to demolish the existing structure, permits show, and submitted plans in late April to build two four-story, eight-unit buildings in its place, as first reported by New York YIMBY. A permit to build two three-story, 3,400-square-foot residential homes on the site of a single-family Victorian house which has been demolished in Prospect-Lefferts Gardens was approved by the Department of Buildings April 9, records show. The owner, Kamran Badkobeh, bought the property for $1.1 million in June of last year before transferring ownership to an LLC. The news of the project was first reported by Brownstowner. A stop-work order is in effect at this construction site, where an old garage was razed to make way for a six-story, 19,000-square-foot apartment building, according to Department of Buildings records. The property was purchased in 2013 for $625,000 by 293 Hawthorne Venture, LLC, the same company who applied for work permits. It’s unclear when construction will begin again at the site; it was stopped in late March because a neighbor complained that the work was “causing my building to shake,” according to the DOB. This former parking lot is set to turn into a four-story, eight-unit apartment building, according to building permits filed in late March by a representative of developer CGS Builders. Architect Michael Avramides will design the building, according to reports. 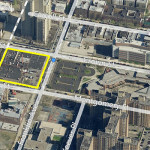 Brooklyn developer Brookland Capital plans to turn this Clarkson Avenue parking lot into condos, its founder said in February, after the company bought the 4,584-square-foot vacant lot for $1.35 million. No specific plans for the building project have been filed for the property yet. A six-story, 16,300-square-foot residential building designed by architect Karl Fischer will replace a small garage on this mostly empty lot at the corner of Rutland Road and New York Avenue, according to building permits filed in February. 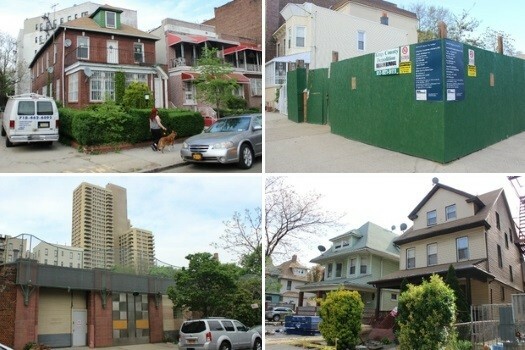 The developer is David Dilmanian, working through “NY Lefferts LLC,” according to reports. The LLC bought the lot for $1.5 million in November, public records show. 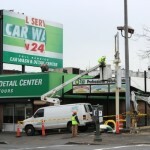 This car repair shop still in operation on the corner of Hawthorne Street and New York Avenue will soon give way to a six-story, 37-unit building with 19 enclosed parking spaces, according to a permit filed in late February by Barry Farkas of New York Avenue Lofts LLC. News of the project was first reported by New York YIMBY. Permits are pending for a six-story building to go up on this corner lot at Maple Street and Brooklyn Avenue, according to building records. The owner of the property, 469 Maple, LLC, bought it for $550,000 in 2008. Construction fencing currently surrounded the empty lot, where a single-family home stood until it was demolished earlier this year. Owner Nadav Ohana of Maple Street LLC is turning this vacant lot into a four-story, six-unit residential property, according to a building permit filed in March. The LLC bought the property in August 2013 for $200,000, public records show. News of the project was first reported by New York YIMBY. 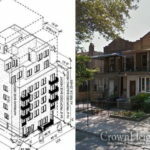 A single-family home built in 1910 will be replaced by a four-story, six-unit apartment building, according to property records and a building permit submitted to the city by Solomon Schwimmer of Benmen Interiors of Williamsburg. The property was bought by the Ozone Park-based company Big Brooklyn Rehab for $180,000 in December of 2014, a deed shows. The more people that move down to our area the better. This is called the gentrification of our neighborhood, and it’s for the better. I would guess that all developers would try to maximize profits, rather than help our community for a little less profit. This means that none of these developments are likely to be suitable for our families (possibility to put up Sukkah, appropriate size for Jewish families, kosher kitchens, etc.). more yuppies in CH. hows that for a amazing community council ? everybody is missing the main factor. the Rebbe would constantly tell unzer real estate magnets to buy buy buy real estate here in crown heights,but did they listen.a nechtin tog,and thats why there will never be any affordable housing .every body else is buying to make us move on out. you had me at Chevro !! There is no room for the influx of more people. The roads are congested, the subways are overfilled. sidewalks are becoming like Manhattan. The electric grid will fail the sewers will back up. Brooklyn must stop building new houses. Fix the old ones. Maybe build an Eiruv and a Non Lubavitch shul and try to attract Chassidim? How does that help anash who cant afford the high rents and cant afford to buy houses?? Its out of control and only getting worse!